The Nutcracker Swings is CBLA's tribute to the classic tale of the Nutcracker. 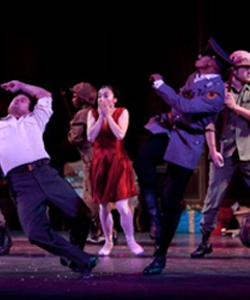 Set in 1942 in Hancock Park and the iconic Cocoanut Grove during WWII, the audience will be swept away to another world while dancers swing to the sounds of Tchaikovsky and Duke Ellington. In this version of the classic family ballet, Maria, the heroine falls for the leading man, Jim, a WWII hero who gives Maria the Nutcracker doll which kicks off a whirlwind journey of Christmas Wonder.